Below I summarize thoughts about the importance of Shenzhen in shaping China’s post Mao utopianism. In the heady rush of hyperbole, it is tempting to describe the SEZ’s first thiry years as the – Unprecidented! Miraculous! Epic! – jump of a lowly county from the lowest escholon in the state apparatus to one of the highest. More prosaically, the systemic re-invention of Baoan County as Shenzhen Municipality took place over a series of administrative adjustments and concomitant reallocation of authority, responsibilities, and fundamentally, rights to the national allocation of people, services, and goods. From 1978-1982, the Central Government and/or Guangdong Province restructured Baoan County four times. Each restructuring had a different ideological meaning and aimed to created a different form of post Mao utopia. These ideological differences – more precisely different understandings of the utopian content of modernization – continue to vex the development of Shenzhen. In 1979, Baoan County was elevated to Shenzhen Municiaplity. In 1980, an 84.5 kilometer administrative boundary, known as the second line (erxian) divided the Municipality into the Special Economic Zone (SEZ), which occupied 327.5 km2 of the Municipality and the rest; New Baoan County was formally reinstated in 1981. Importantly, the SEZ was not the first effort to reform Baoan – the China Merchants Shekou Industrial Park was first by several months. The timeline below points to the scale and type of rural-urban contradictions which constituted Shenzhen Municipality and its subsequent redistricting as the Shenzhen SEZ and New Baoan County during the years 1978-1982, culminating in the promulgation of the 1982 Plan for the Shenzhen SEZ and the first articulation of Shenzhen utopianism. This four-step foundation had critical consequences for the form and content of Shenzhen as city with a recognizable society and cultural ethos, not to mention the Municipality’s particular flavor of utopianism. It also illustrates increasing forms of decentralization, even as the persistent division between urban and rural Shenzhen / Baoan would enable new forms of local and state authority. Below, I provide a brief contextualization of each of the four first steps in order to highlight the actual moment of structural reform and to note the associated utopian transvaluation. Not unexpectedly, these themes will continue to reappear throughout the city’s history, providing symbolic landmarks for navigating future reforms as well as national and local debates over the direction, means, and consequences of reforming and redeploying administrative units – ranging from ministries and bureaus to collectives and productive work units – within the Chinese state apparatus. In other words, during the three years spanning 1978 to 1982, the establishment of Shenzhen initiated the conversion of Maoism into something that in retrospect was labeled “Socialism with Chinese Characteristics”. The earliest of the initial reforms, the establishment of Shekou conformed structurally and historically to that of “large compounds”, reforming the state apparatus through redeployment of resources toward particular goals rather than through actual re-designation of rural areas as “non-rural” or urban. The mission of Shekou China Merchants first appeared in Yuan Geng’s petition to the Central Government to use China Merchants Hong Kong in order to develop an industrial zone and concomitant shipping industry. In effect, the deployment of China Merchants entailed reclaiming a branch of the Chinese state apparatus that had been languishing just south of the border since 1949. Consequently, Shekou not only functioned as a large non-rural compound exempt from the structural constraints on nearby collectives, but also operated with a high level of independence due to its special relationship with Hong Kong. The level of independence from the centralized plan that China Merchants received would be transformational for both the definitions of “leadership” and “worker” in Shekou, thereby initiating discussion about the necessity of having the Central Government assign jobs to college graduates. At the same time that the Central Government transferred leaders and skilled workers to Shekou, it permitted China Merchants to negotiate a land transfer of roughly 10 km2 with the three squads (Wanxia, Yunong, and Sihai) that had been part of the Shekou fishing collective. As rural areas, the collectives negotiated housing, access to the Pearl River to pursue their fishing livelihood, and a nominal amount of capital to reinvest. The resultant segregation between CM-Shekou and local Shekou, as well as the special relationship between Shekou and Hong Kong by way of a state enterprise illustrates two latent contradictions within the first structural reforms in Shenzhen. First was the contradiction between administrative levels. Top-down planning was schematic – develop an industrial zone, for example. Simultaneously, the absence of any ground level infrastructure meant that whoever came to the SEZ had to make on-the-ground decisions about the direction of development, making “interpretation” of the “intent” of a plan critical. Importantly, in Shekou this first appeared as a contradiction between the central and local governments, however, it was soon replicated throughout the entire hierarchy as planning and implementation grew further apart, such that even within bureaus it became difficult to predict how a subordinate would interpret directions. The second contradiction was between outside work units that had the support of the state apparatus and local collectives that for the first time were in a position to negotiate directly with officials responsible for economic planning. Specifically, it is important to notice that although there was hierarchical contradiction within Shekou, with respect to Shekou collectives, China Merchants operated as a state work unit with corresponding rights and privileges. For example, decision to open the Shenkou Industrial Park meant that even if the collectives had the right to negotiate compensation for land transfer, they did not have the corresponding right to either oppose or offer an alternative development plan. In other words, the Shekou model became the template for progressive neo-liberal urbanism in Shenzhen. In contrast to the establishment of China Merchants Shekou, the March 1979 elevation of Baoan to Shenzhen entailed a change of function (the area could pursue industrial urbanization), but not a change in ranking because Shenzhen still was under the authority of the Huiyang Dedicated Region, which was seated at Huizhou and Guangdong Province, which was seated in Guangzhou. In official documents, this appears as “double administration (sheng、di shuangchong lingdao)”. Shenzhen Municipality’s bump to region rank first class independent provincial city (diqu yiji de sheng zhixiashi) occurred in October that year, legalizing the Municipality to the rights and privileges of a sub-provincial city. As in Shekou, Shenzhen’s new status meant that it had access to the state resouces to pursue develoment goals. Also as in Shekou, the earliest planning for Shenzhen took the form of general landuse without any reals plan for how to achieve desired outcomes. However, unlike Shekou, Shenzhen Municipality was to mediate between the Central Government, Guangdong, and multiple work units, which of course did not yet exist. In order to create work units, the central government assigned national work units large tracts of land to develop. In turn, each work unit was to negotiate directly with different collectives to transfer land and to allocate personel to Shenzhen. In other words, where Shekou was located within a recogniziable place within the state apparatus, in Shenzhen, there was no precident for building urban infrastructure within and across multiple collectives. The Central Government resolved this problem by deploying the People’s Liberation Army Engineering Corps, which from 1979 through 1982, put in the basic infrastructure on which Shenzhen was built. The deployment and subsequent disbanding of the Engineering Corps constitute the earliest and most often overlooked ways in which the construction of Shenzhen Municipality transvalued Maoist utopianism. Unlike Mao, who had used military metaphors to mobilize society, in Shenzhen, although Deng Xiaoping had reputedly said that Shenzhen needed to “cut open a road of blood”, fending for itself, nevertheless metaphors of urbanization were used to socialize the military. The importance of the Corps’ contribution to the Shenzhen utopian discourse was three-fold. First, they determined the layout of early Shenzhen, building north-south along the Kowloon – Canton Railway tracks and then east-west from the Wenjindu Border Checkpoint to the site of the Shanghai Hotel. Dongmen, the traditional market area that had grown up around the Luohu train station remained the commercial center of the nascent city. Caiwuwei, the location of the Baoan County Seat offices became Shenzhen’s first government center; their work gave Shenzhen an identifiable “downtown”. Second, when national and provincial media constantly eulogized the Corps’ patriotic self-sacrifice to build the country, they showed images of soldiers working toward social construction; in Shenzhen, generals became urban planners and civil engineers, officers became architects, and soldiers became construction workers. Third and most importantly, the presence of the Engineering Corps also enacted an important continuation with Maoist values in contradistinction to Maoist methods; their presence confirmed that construction of industrial manufacturing zones was part of the ongoing construction of socialism and hence patriotic. Indeed, the patriotism of labor in and of itself would be one of the early (and more transitory) Shenzhen transvaluations. The third structural adjustment, the establishment of the SEZ in 1980 was the most famous and ideologically resonant for subsequent Shenzhen transvaluations of Maoism. In early 1980, as China Merchants began construction in Shekou and the Engineering Corps reconstructed the area around Caiwuwei and Luohu / Dongmen, it became evident the new Municipality was bigger than even self-sacrificing soldiers could build. Consequently, in 1980, the Central Government established a smaller SEZ, the borders of which became Shenzhen’s second line (erxian), which until around 2003 functioned as an internal border with checkpoints. Chinese nationals needed travel permits to cross from New Baoan County into the Shenzhen SEZ and work permits in order to have access to social welfare benefits. This level of border control was possible because the loosening of economic controls did not entail respective adjustment of hukou restrictions, which meant that rural communes and urban work units controlled the transfer of personel to Shenzhen. Fourth, the establishment of New Baoan County institutionalized the struggle between rural collectives and urban work units to control social development, eventually symbolizing the need for urban trained bureaucrats to take the lead in urban planning and development. 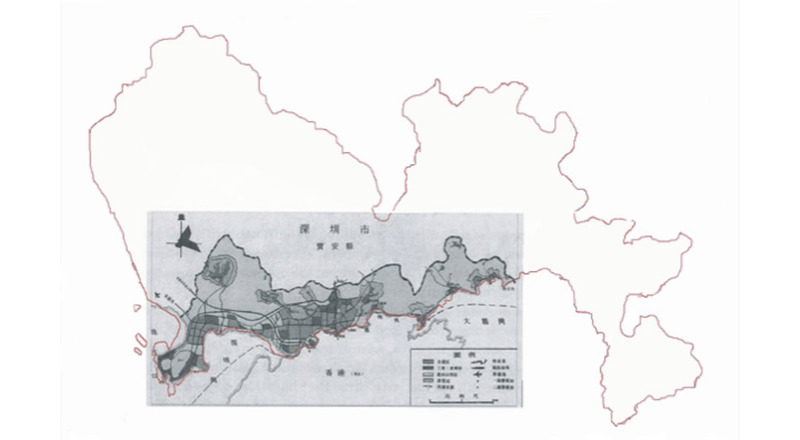 A glance at the 1982 Overall Plan for the Shenzhen SEZ graphically illustrates how the Shenzhen municipal apparatus internalized inherited contradictions between rural and urban China. In fact, the redistricting of Shenzhen Municipality into the urban SEZ (1980) and rural New Baoan (1981) meant that only a small portion of city territory was initially considered in any kind of integrated planning and under the jurisdiction of the new city government. In the 1982 Plan, for example, a narrow east-west strip of land was divvied up and filled in with one of four colors, representing four types of landuse – residential, industrial and grain storage, agricultural, and tourist. Much of the SEZ was zoned for agricultural use, with lychee orchards given particular preference. In other words, only the SEZ was considered for industrial urbanization; collective lands outside the SEZ were tacitly left to local collectives to develop. Or not. The first generation of Shenzhen municipal leaders assumed that the rural areas would continue to be primarily agricultural, with local farmers growing vegetables and raising pigs for the SEZ markets. In fact, the swathe of land that would become New Baoan County technically existed in a state of administrative limbo from August 1980 through October 1981! Tellingly, when the 1982 Urban Plan is juxtaposed against a silhouette of the City’s actual borders, the resulting image graphically reminds us how beyond their ken Shenzhen’s first generation of urban leaders considered New Baoan County to be; the 1982 Plan does not even include a complete rendering of the Municipality’s actual borders (see Image below). This image graphically reminds us that in Shenzhen, unlike in other Chinese cities or rural areas, the means of production – land, capital, and labor – were shared between, rather than monopolized by either the urban State or a rural collective. The Baoan collectives, within and outside the SEZ, controlled land. Moreover, local people had individual landuse rights that had been legislated to them as compensation for their exclusion from forms of urban welfare. Insofar as Shenzhen’s collectives were no longer constrained by the national plan to produce quota grains, many set up low-tech manufacturing parks within their borders, taking advantage of kinship networks that exended worldwide by way of Hong Kong to secure investment capital. The municipal government had access to capital because the central government had legislated the SEZ’s right to bring in investment, both from Chinese ministries and other provinces, as well as from abroad. In addition, as part of the state allocation, the Municipality also had access to the deployment of skilled labor; in addition to the Engineering Corps, the Central Government would also deploy large numbers of technical personnel to Shenzhen. Further complicating the transition from collective to municipal governance was the need for labor to build the city. Even though hukou restrictions obtained, nevertheless, during the first years of the SEZ’s existence, hundreds of thousands of young people, rural and urban, breached the second line to find jobs. In fact, as of the 30th Anniversary of the SEZ, Baoan had yet to be completely transvalued. Or rather, what emerged in Shenzhen was the constant need to urbanize the rural in whatever form it took. Baoan locals successfully implimented an alternative urbanization that was both industrial and non-rural – manufacturing, earnings from rents, dense settlements, electricity, roads, internet access defined daily life in their new villages. However, the form that this modernization took remained outside successive development plans, and in that sense remained “rural” to the SEZ’s “urban”. In many ways, the first several years of Shenzhen’s existence constituted a mythic chaos, which in retrospect many found hard to define. Structural reforms were initiated. Roads were built. Locals built factories. The second line was breached. The Engineering Corps waded into local cesspools, most famously clearing the Buji River of years of accumulated waste and sewage. Heroes emerged. Nevertheless, four foundational themes in Shenzhen utopian discourse appeared during that confused and confusing moment of stutterstep structural reforms: the need to reform work unit heirarchies to further political and economic goals; the place of urban planning in the SEZ’s emergent political apparatus; the rebranding of the CCP by casting Deng Xiaoping as the vissionary to lead the PRC into a global order and; the unplanned boom of economically enfranchised Baoan villages, which became social incubators where rural migrants went in farmers and became the urban prolotariat that labored in the factories that became Shenzhen’s economic base. And this messiness, this open-ended opportunity in which both the terms of transformation and the direction of transformation were up for grabs came to define the early Shenzhen Spirit. On the one hand, individuals who came to work in urban work units experienced opportunities to proactively find employment, but also to contribute to the design and implimentation of political hierarchy and its expression through urban construction. This on the ground citizen participation in the construction of a new city was the utopian vision that city, provincial, and national leaders worked so hard to export throughout neidi, which when spoken in early Shenzhen referred to those hinterlands beyond the second line, including (for a golden moment) Beijing and Shanghai. On the other hand, the exclusion of rural Baoan from this radical opening of the state apparatus predicated the SEZ’s success. In other words, even thought the SEZ’s inclusive utopianism was limitted to urban immigrants, nevertheless Shenzhen revitalized transformation of the Chinese state apparatus precisely because state socialism had been an urban project. Nevertheless, this golden era was short lived. The SEZ’s rural other, Baoan went at first unnoticed, but increasingly grew in size and shape and influence, until – from the point of view of urban Shenzheners and cosmopolitan urbanites throughout China – rural urbanization constituted the dystopian underbelly of uncontrolled and unplanned development. Such are the ironies of history. How much space New Baoan actually occupied was not determined until, the early 1990s, when formal geographic surveys were completed. Legal boundaries were finalized with the administrative division of New Baoan County into Baoan and Longgang Districts. China Merchants had been established in 1872 as part of the Late Qing’s self-strengthening movement and been active throughout the Republican period. However, after thirteen shipboard uprisings toward the end of 1949 and early 1950, China Merchants Hong Kong did not participate in Mainland development. As part of the 1979 reforms, dedicated regions (zhuanqu) were renamed regions (diqu). Neidi means “interior” and usually refers to the hinterland of a particular city. In contrast, Shenzhen inhabitants used neidi to refer to the rest of the country. This entry was posted in noted and tagged history, modernization, PLA Engineering Corps, post Mao society, second line, shekou, shenzhen, shenzhen identity, utopianism. Bookmark the permalink.